Halloween, also known as “Break the Internet with Your Noveling Angst Day,” or “Reverse Triskaidekaphobia Day,” is upon us. It is the day when too many of us eat too much bad candy (or argue that there is no such thing as “bad” candy, declaring that the witches have decreed Halloween to be magically calorie free). It is the day when parents convince small children that all the chocolate in their treat bags is “yucky” and offer to take it off their small, grubby hands. It may be the last day, for some, where that trick still works. Alas, the little goblins do grow up and discover the joy of chocolate. Even the dark chocolate is not safe, by the time the little monsters are one and twenty. 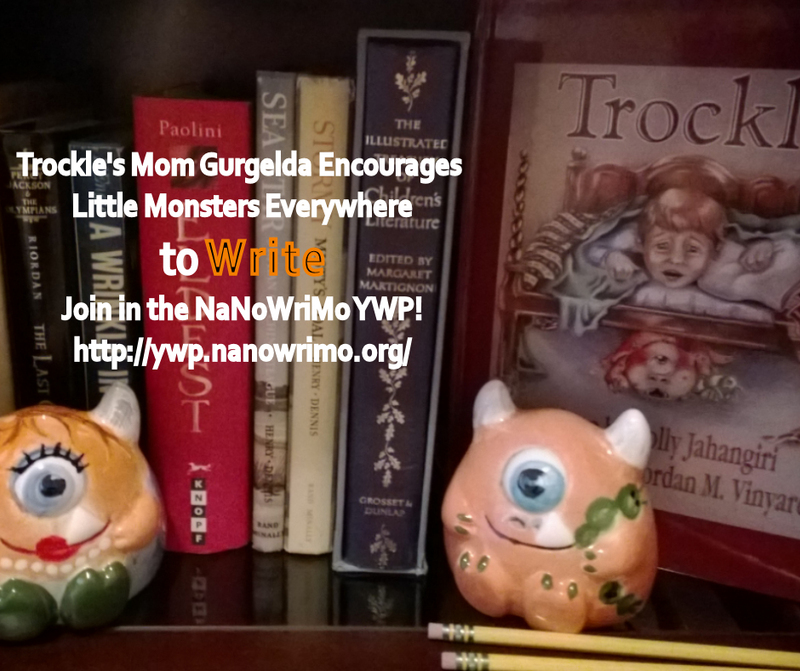 Speaking of little monsters, Trockle and his mom, Gurgelda, want me to wish you all a Happy Halloween on their behalf, and to remind you that National Novel Writing Month is not just for grown-ups. Did you know that they offer a really fun and excellent writing program for children and teens, as well? If you’d like to learn more, just drop by http://ywp.nanowrimo.org. It’s not too late. It’s never too late to spark a love of language and set a young person’s feet on the path to being a writer. I mean, they will end up being a writer with or without your encouragement, most likely, if that’s where destiny leads them. But by then, it may be too late to guarantee you’re immortalized in a dedication, or to ensure that you’re not turned into an ax-wielding psychopath or that character who stupidly insists on going up the stairs in the dark to “check things out” while the creepy music plays. So think about it. I think you’ll see the wisdom in encouraging young readers and writers with lots of books, pens, paper, and writing time. It’s much more fun to be the protagonist, if you know what I mean. It is the one day a year I will happily share this on my blog. Tomorrow, I will smash it and kill it with fire. Not really. The little Halloween-hued orb-weaver is quite industrious and charming, spinning his trap lines outside my kitchen window, stretching them from bricks to oleander, and knows better than to creep indoors and startle me when I am standing near the knives and blunt objects like giant silicone spatulas. He would not want his crunchy, brightly colored self to be mistaken for a Halloween candy when tiny Trick-or-Treaters arrive. We coexist peacefully, and wish the rest of the world would follow suit. If we can, anyone can. Hey Holly, happy Halloween and all that. I’ve heard even you Aussies don’t like vegemite. I’d try it – if I could find any around here. I guess we’re doing a better job of the marketing ploys. Actually it’s my honest opinion that most Aussies love vegemite. Those who don’t know how to use it. Works best on buttered toast and used sparingly. You certainly don’t lay it on thick as if it was jam or something. Speaking of jam why do you guys call it jelly? There’s jam, jelly, and preserves. I’m pretty sure they’re supposed to be synonymous – but to me, jelly’s clear (colored, but no visible chunks of fruit) and probably mostly sugar. Preserves are closer to the way your grandma would’ve made them – thick with real fruit and seeds. Jam? I don’t know – Brit for “stuff you spread on toast”? Thank you for posting a picture of Trockle rather than of the orb-weaver. And jelly is clear, jam is all bits in, and preserves are whacking great chunks. I tried to post the orb weaver! I don’t know why the embedded post isn’t embedding! Thanks for clarifying (and confirming) my sense of what jelly, jam, and preserves are! As far as Aussies are concerned our jelly doesn’t spread on bread, we usually serve it as a desert on its own or with ice-cream. Now, see, I’d put PRESERVES on ice cream, but never jelly. Fig preserves mix well into vanilla yogurt, too. I think because what you call jelly and what we call jelly is two different things. Like if I want jelly I just buy some jelly crystals, mixed in warm water and put it a bowl in the fridge and wait for it to set. Peter recently posted…Canon MG7160 Not Scanning Wirelessly? Wonderful post about my favorite holiday! We actually managed to limit ourselves to one candy bar each. I still have a few bites left on mine. Your orb weaver is gorgeous!!! I was lucky enough to have one just outside our garage from August 1 through August 17. I got many wonderful pictures of her, and even managed to get video of her weaving! I’ve never caught one weaving! We usually get one or two – this is the first time I’ve seen an orange and black one. I’ve seen red and black, mostly. They’re lovely. Almost…unspiderlike. I try to pretend they’re not spiders. 🙂 (I’m arachnophobic.) I’d love to see your video! That was amazing! Yours looks much larger than the ones we have here – or maybe I’ve only ever seen them with their legs tucked in under their shells.